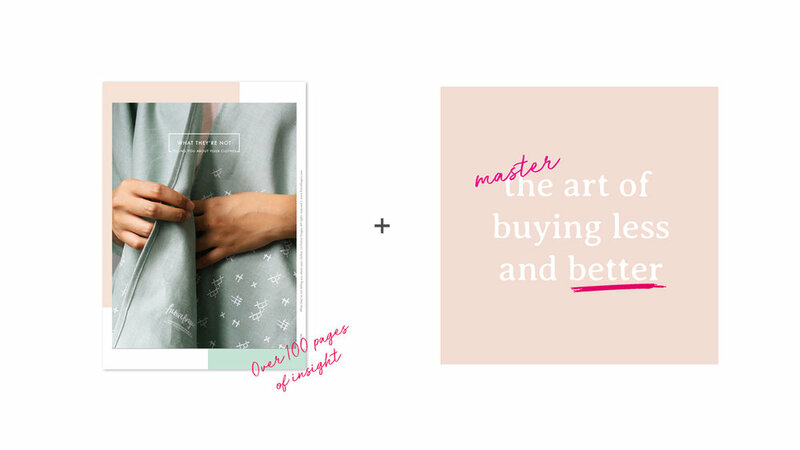 Master The Art of Buying Less and Better is a web series and an indispensable follow-up of our e-book What They’re Not Telling You About Your Clothes that has been a transformative tool for readers since its release in November 2018. It’s time to be in control of the clothes you welcome into your life. Defining what “quality over quantity” means to you so your clothes can last for years and you get the most value out of your hard-earned money. No more dipping your toes in the water, we’re here to help you sift through all the clothes out there and clever marketing by arming you with insight and a discerning eye to find the clothes truly made for your body and lifestyle needs. How do you buy less and feel you have all that you need? And how do you even know what kind of clothes are better for you? From helping a mother-of-two feel like her best self after evaluating her clothes to supporting an aspiring minimalist whose relationship with clothes was once "love at first sight". And so much more. The fact that you’re here, right now, tells us that you’re well on your way to take your relationship with clothes to the next level. Combine your less-is-more attitude with our guidance, you’ll have a transformative experience of your own. What They’re Not Telling You About Your Clothes e-book delivered to your inbox for you to get started right away. Master the Art of Buying Less and Better web series released weekly starting May 1st. Limited slots: An invitation to our first community gathering where we’ll talk about the fabric that touches your skin daily with the Fictive Fingers Fabric Kit then bring it home! We believe in the power of real-life connections and sharing stories filled with lessons, breakthroughs and humour. If you’ve been to any of our past open studio events or classes, you’d know that we’re big on making your time well spent. This community gathering centers around the struggles of buying less and better here in Singapore where we’re spoilt for choice, lured by convenience and easily distracted by the wants of others, not our own. But you’ll walk away inspired to break down your wardrobe goals into actionable steps. We’ll dive into the fabric that touches your skin daily, referring closely to the Fictive Fingers Fabric Kit that’s free for you to bring home! A 2-hour, hands-on learning experience in the morning of May 4th with special guests to be announced. We’re the sister duo textile designers always up for sharing what we know. Throughout our career that spans almost a decade, we’ve taught people from all walks of life so generously that some wonder why we’d share our trade secrets. We don’t believe they’re secrets but knowledge that’s valuable when applied and shared. Sure, it took us years of synthesizing research, data and personal experiences but if we could help you make careful, smart decisions, all that effort is worthwhile. It’s also important to us to make the learning experience affordable for you so the only thing that’s stopping you from gaining access to all the insight is a click of a button. But if you think all those random, free information you can find online are good enough for you, this is not for you. We strategically designed this learning experience to strengthen your understanding every step of the way so that eventually, it feels effortless to buy less and better — our e-book readers can attest to that. If you’re ready to transform your wardrobe and your life, we’re honoured to be your guide.